Qtopia Core uses the FreeType 2 font engine to produce font output. The formats supported depends on the locally installed version of the FreeType library. In addition, Qtopia Core supports the Qt Prerendered Font formats (QPF and QPF2): light-weight non-scalable font formats specific to Qtopia Core. QPF2 is the native format of Qtopia Core. QPF is the legacy format used by Qt/Embedded 2.x and 3.x. Several of the formats may be rendered using anti-aliasing for improved readability. When Qtopia Core applications run, they look for fonts in Qtopia Core's lib/fonts/ directory. Qtopia Core will automatically detect prerendered fonts and TrueType fonts. For compatibility, Qtopia Core will also read the legacy lib/fonts/fontdir file. Support for other font formats can be added, contact info@trolltech.com for more information. The FreeType, QPF2 and QPF formats are features that can be disabled using Qtopia Core's feature definition system, reducing the size of Qt and saving resources. Note that at least one font format must be defined. See the Fine-Tuning Features in Qtopia Core documentation for details. All supported fonts use the Unicode character encoding. Most fonts available today do, but they usually don't contain all the Unicode characters. A complete 16-point Unicode font uses over 1 MB of memory. It is possible to add modules to the FreeType 2 font engine to support other types of font files. For more information, see the font engine's own website: http://freetype.sourceforge.net/freetype2/index.html. Glyphs rendered using FreeType are shared efficiently between applications, reducing memory requirements and speeding up text rendering. The Qt Prerendered Font (QPF2) is an architecture-independent, light-weight and non-scalable font format specific to Qtopia Core. 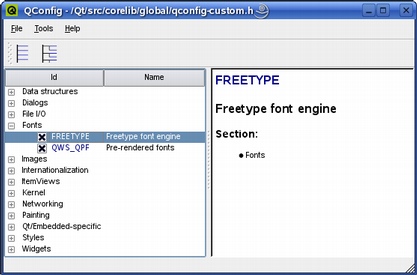 Trolltech provides the cross-platform makeqpf tool, included in the tools directory of both Qt and Qtopia Core, which allows generation of QPF2 files from system fonts. QPF2 supports anti-aliasing and complex writing systems, using information from the corresponding TrueType font, if present on the system. The format is designed to be mapped directly to memory. The same format is used to share glyphs from non-prerendered fonts between applications. Trolltech provides support for the legacy QPF format for compatibility reasons. QPF is based on the internal font engine data structure of Qt/Embedded (Qtopia Core's predecessor) versions 2 and 3. Note that the file name describes the font, for example helvetica_120_50.qpf is 12 point Helvetica while helvetica_120_50i.qpf is 12 point Helvetica italic. name The name of the font format, e.g.,Helvetica, Times, etc. file The name of the file containing the font, e.g., helvR0810.bdf, verdana.ttf, etc. renderer Specifies the font engine that should be used to render the font, currently only the FreeType font engine (FT) is supported. italic Specifies whether the font is italic or not; the accepted values are y or n.
weight Specifies the font's weight: 50 is normal, 75 is bold, etc. size Specifies the font size, i.e., point size * 10. For example, a value of 120 means 12pt. A value of 0 means that the font is scalable. All other flags are ignored.